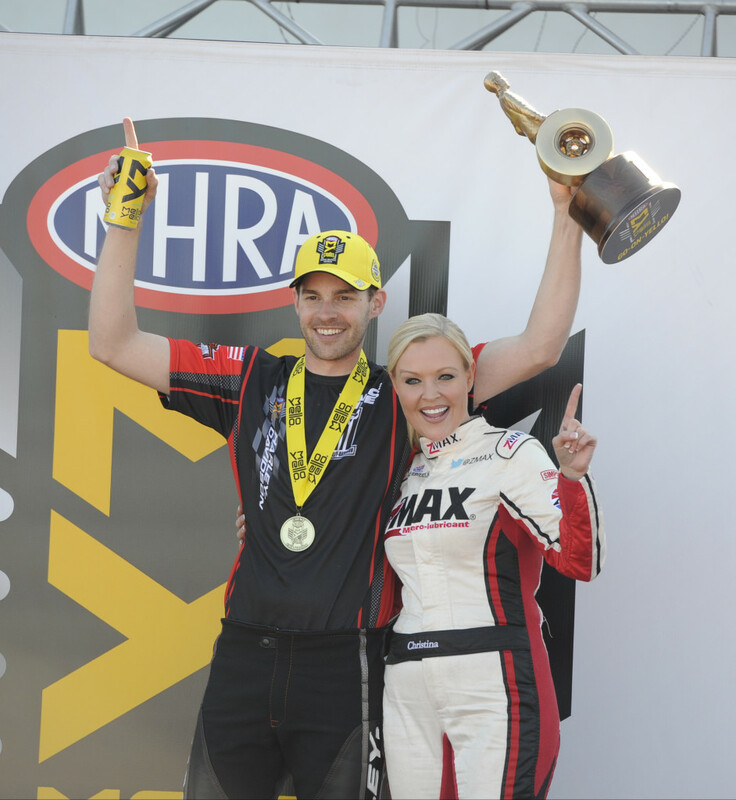 It was Brittany Force and Tim Wilkerson who became the first repeat nitro winners in their respective Top Fuel and Funny Car categories in the 2016 NHRA Mello Yello season, battling it out in the one-of-a-kind NHRA 4-Wide Nationals at the Bellagio of dragstrips, the zMAX Dragway. Jason Line continues his competitive climb to the top driving his Ken Black Summit Racing Chevrolet with his third Pro Stock win in the EFI era, and Andrew Hines rode roughshod over the Pro Stock Motorcycle with incredible ETs all weekend for the two-wheel class. 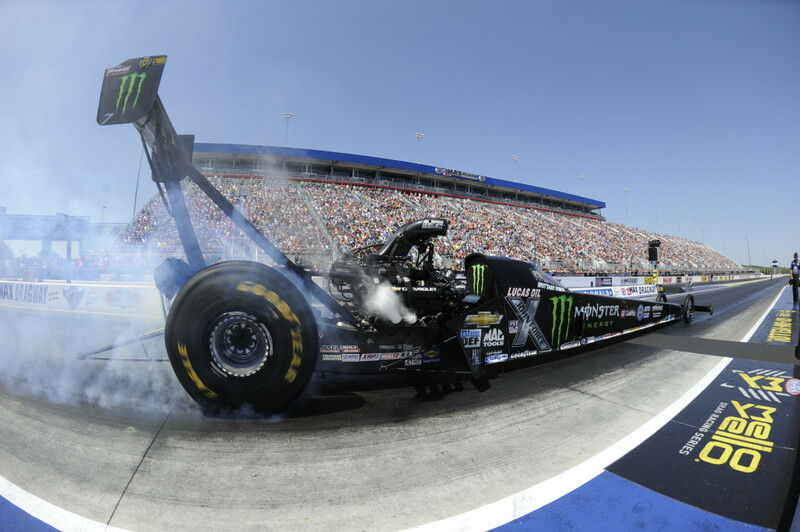 It was a great performance for John Force Racing’s Monster Energy Top Fuel team right from the start of eliminations in that you weren’t going to beat Brittany Force on this Sunday. 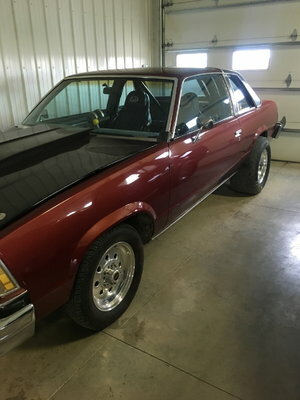 She laid down a low Elapsed Time of 3.734 seconds in the opening quad and her tuner, Alan Johnson and crew chief, Brian Husen kept her on target, giving the 29-year old young lady the quickest ride every round and she proved it with her right foot. 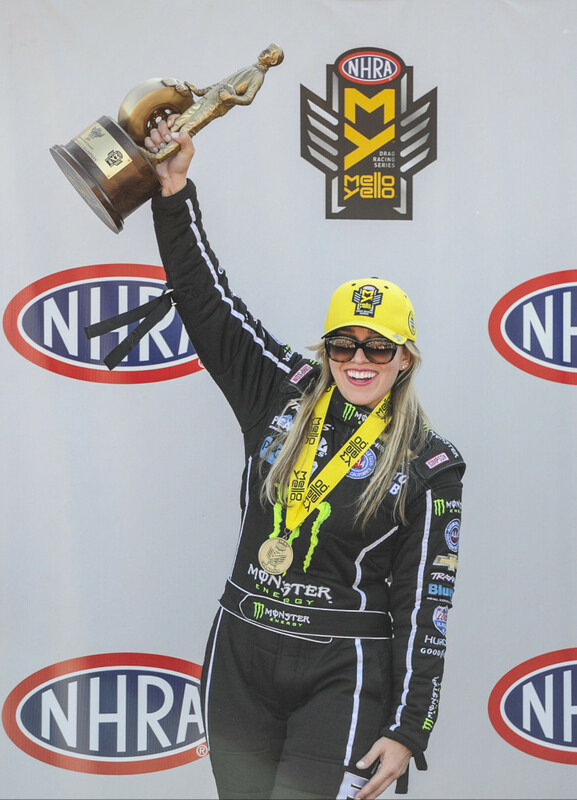 It may have taken her 75 races before breaking through at the Gatornationals for her first career NHRA win; it would only take two more races to get her second. In her final round quad, she marched through Clay Millican, Antron Brown and Doug Kalitta to win, running a 3.764 seconds, 319.98 mph pass to reach the finish line first, but didn’t know if she had won and coasted to the turn off area. 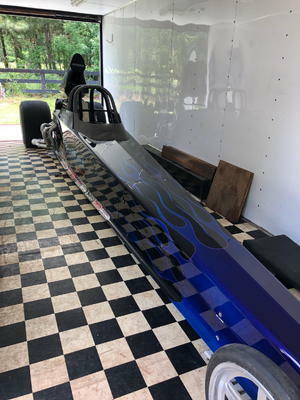 She became the first repeat Top Fuel winner of 2016 after the first five events have been completed and felt she owed her JFR crew a big salute for their diligent efforts led by Alan Johnson and crew chief Brad Husen. Force became the first female professional racer to win in the 4-Wide format and has raced to three final rounds in the past four races, winning 12 rounds and extending her points lead to now 63-points over Antron Brown, who was runner-up in all three elimination rounds to the dominant Force. 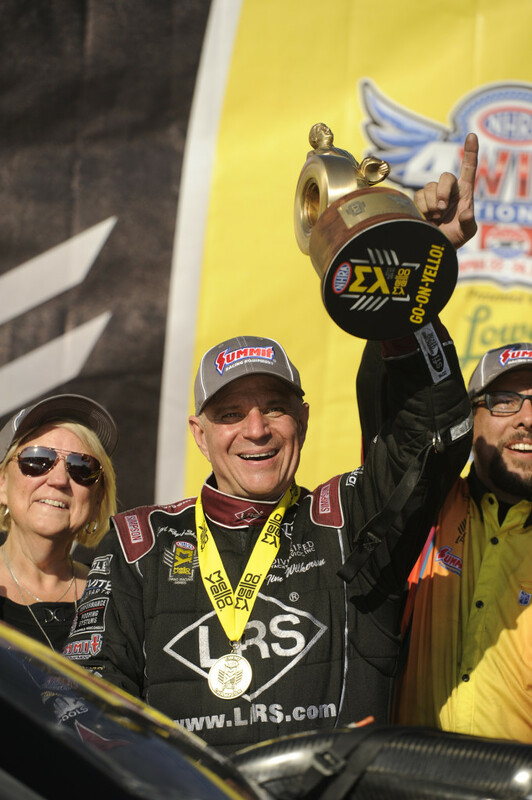 Like Force, Tim Wilkerson came to race and led the way, putting down low ET every round proving that his Sunday’s run wasn’t any fluke, now taking the fourth position in the Mello Yello Funny Car points standings. It was his second Funny Car victory of the year and 20th overall in his 20-year career. The 4-Wide prognosis was noted that in Funny Car, staging was a priority. Trying to get four cars to start up in approximate time and staging of the other drivers can either make or break the race. Wilkerson’s viewpoint is to just run your own race and if you’re doing it right, then the other teams will have to pick up the pace to match you or become a problem for the rest of the drivers. “We go up there and hit the gas and see what happens,” Wilkerson said. “It’s just racing. If you get beat, you go home and try again next week. It’s a marathon. We have 24 races. 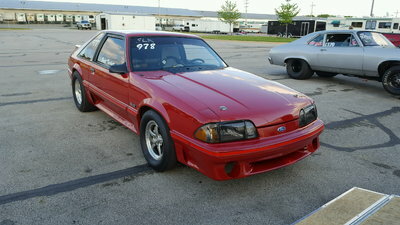 Next race has a different challenge. I think they did a really nice job on all of these lanes this weekend. I think you could win out of any one of ‘em. 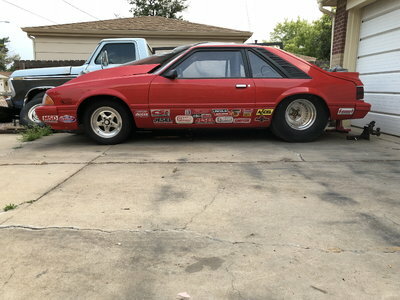 He rocketed to the front of the Funny Car pack in the first round, matching low elapsed time of the event after making a pass of 3.934 seconds to equal No. 1 qualifier Alexis DeJoria’s run. He again led the way in the semi-finals quad running 3.993 seconds before taking down Cruz Pedregon, Ron Capps and Matt Hagan in the finals with his better ET of 3.967 seconds. Now, with Wilkerson winning the 4-Wide Nationals, it’s means something special to him. Robert Hight is the current points leader with an eight-point lead over Ron Capps, followed by John Force, Wilkerson, and Courtney Force in fifth. 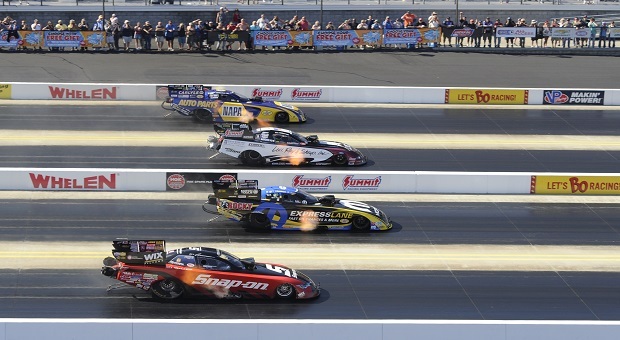 The NHRA 4-Wide Nationals was just another opportunity for the Summit Racing Pro Stock team to put their power on display, and they took full advantage of the current state of affairs. On Saturday, it was Greg Anderson, driver of the red Summit Racing Chevrolet Camaro, basking in the glory as he earned the 82nd low qualifier award of his career, and on Sunday in Charlotte, it was points leader Jason Line’s turn as he bested them all in a four-across battle for the trophy. 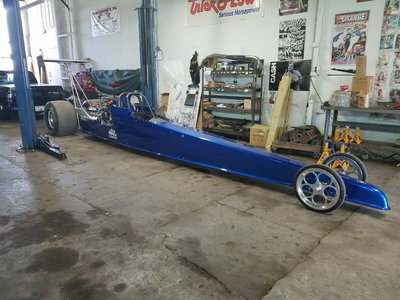 It was Line’s first 4-wide win and second final in the once yearly competition. It was also the 40th Pro Stock win of a career that spans 13 years, which ties the Wright, Minnesota-born driver with Pro Stock veterans Kurt Johnson and Mike Edwards for fifth on the all-time win list. 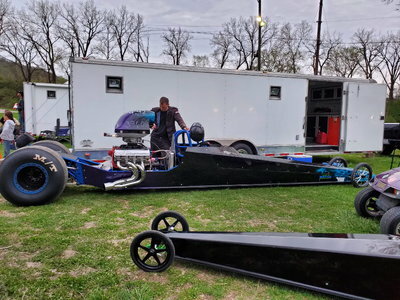 Line began his day with Low ET of the meet, flying down the track at 6.555 seconds along with a booming speed of 211.86 mph – the quickest of the season under the new electronic fuel injection system (EFI). In the second round, Line was again the top performer with a pass of 6.568 seconds, 211.16 mph and in the finals was proven invincible winning over Drew Skillman, Chris McGaha and Bo Butner in a fellow KB Racing Chevy. With everything depending on who would be the first to the stripe, Line flew by the 4-Wide competition running a time of 6.565 seconds, 211.33 mph to win in his North Carolina backyard. Even more impressive, though, was the fact that the win in Charlotte marked the fifth consecutive victory for Team Summit and the KB Racing team. 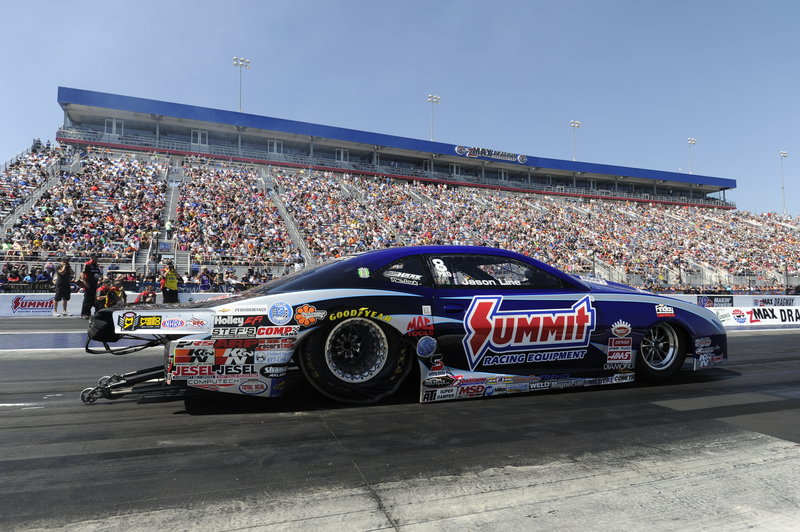 According to NHRA statistician Lewis Bloom, no other team in the history of NHRA Pro Stock has ever won the first five events in a season. “We take a lot of pride in this, because we probably had more changes to make engine-wise than everyone else did,” said Line, referring to the new rules for 2016, which include a change from carbureted engines to electronic fuel injection, but, more critically for KB Racing, a 10,500 rpm rev limiter. In just five races, Line has built a 102-lead over KB Racing teammate, Greg Anderson in the points. Bo Bunter, Drew Skillman, and Chris McGaha follow him in rounding out the top five. 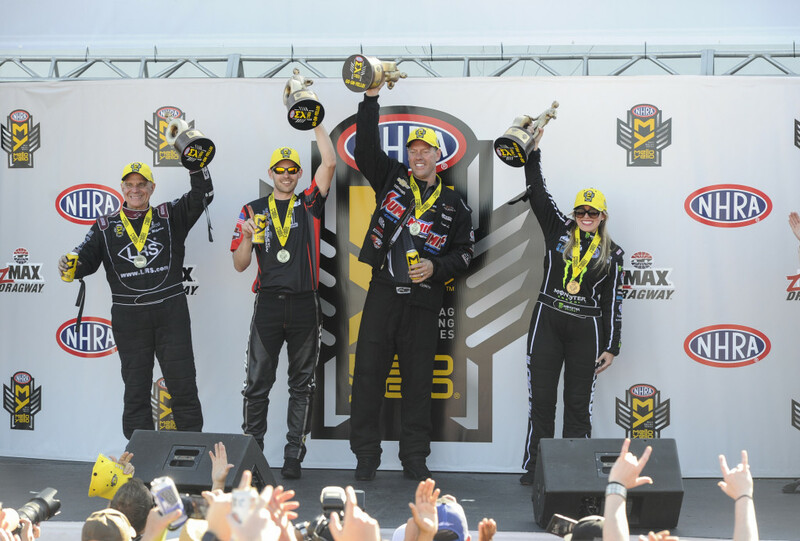 Andrew Hines continued his mastery of the 4-Wide Nationals in Pro Stock Motorcycle and held off top qualifier Eddie Krawiec, Chip Ellis and Matt Smith to take the victory, his third in a row at this event and his sixth zMAX Dragway victory. 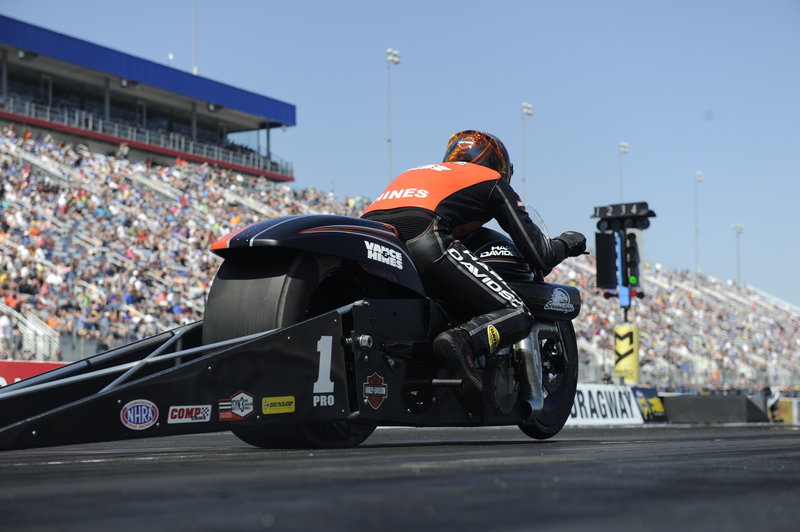 Hines clocked a 6.844 at 194.42 on his Vance & Hines Harley-Davidson, while Krawiec finished in 6.849 at 194.44 on his Harley to take runner-up honors. It was points leader Krawiec’s fourth consecutive runner-up finish at this event. 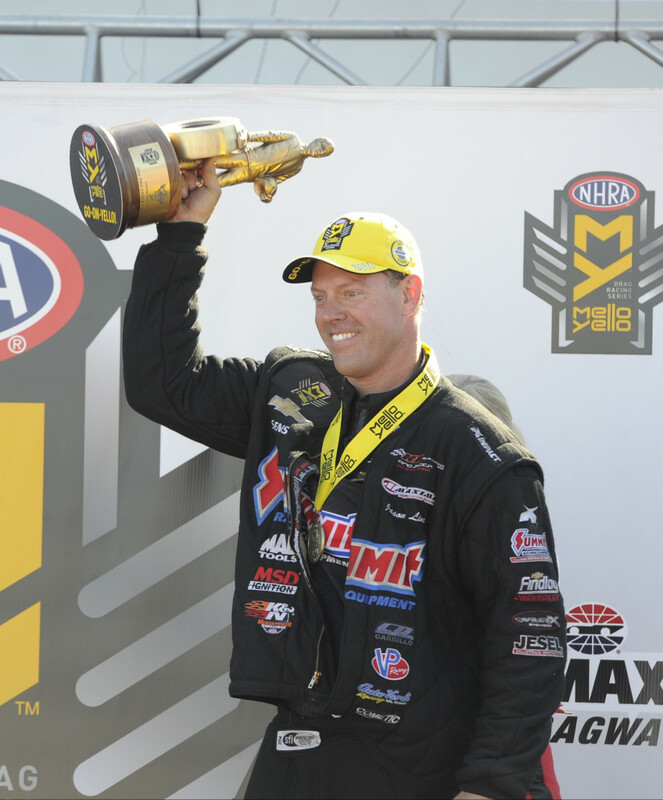 Hines became the third driver in NHRA history, joining Greg Anderson and Hight, and first in the bike class to finish second in both of the first two quads and then win the race. In the opener, Hines finished second to Jerry Savoie, but in front of Brian Pretzel and Jim Underdahl. In round two, Hines trailed Krawiec, but finished in front of Savoie and Michael Ray.